Biology instruction at GGCA involves an academically rigorous overview of important topics in modern biology. Students should expect to encounter up-to-date biology research in context of real-world applications, and supported by challenging core biology studies. We structure the course on a soundly Biblical foundation, and address the topics of origins and bioethics with care and balance. Sophomores at Greater Grace Christian Academy take a year-long survey course in Biology. 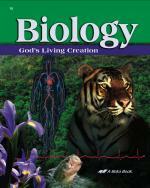 The course is guided by the use of an ABeka textbook "Biology: God's Living Creation" 3rd Edition. The course also includes extensive supplementary materials, and is taught at an "honors" level. Labs usually include classic dissections, microscope work, field activities involving stream & wetland ecology, gardening, and water quality sampling.